Explanation: Four laser beams cut across this startling image of the Orion Nebula, as seen from ESO's Paranal Observatory in the Atacama desert on planet Earth. 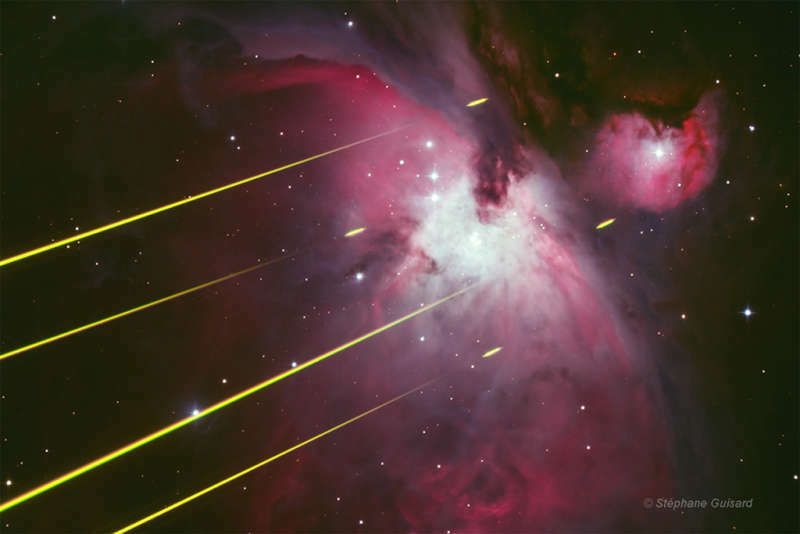 Not part of an interstellar conflict, the lasers are being used for an observation of Orion by UT4, one of the observatory's very large telescopes, in a technical test of an image-sharpening adaptive optics system. This view of the nebula with laser beams was captured by a small telescope from outside the UT4 enclosure. The beams are visible from that perspective because in the first few kilometers above the observatory the Earth's dense lower atmosphere scatters the laser light. The four small segments appearing beyond the beams are emission from an atmospheric layer of sodium atoms excited by the laser light at higher altitudes of 80-90 kilometers. Seen from the perspective of the UT4, those segments form bright spots or artificial guide stars. Their fluctuations are used in real-time to correct for atmospheric blurring along the line-of-sight by controlling a deformable mirror in the telescope's optical path.